Posted on October 23, 2014 at 2:39 pm. 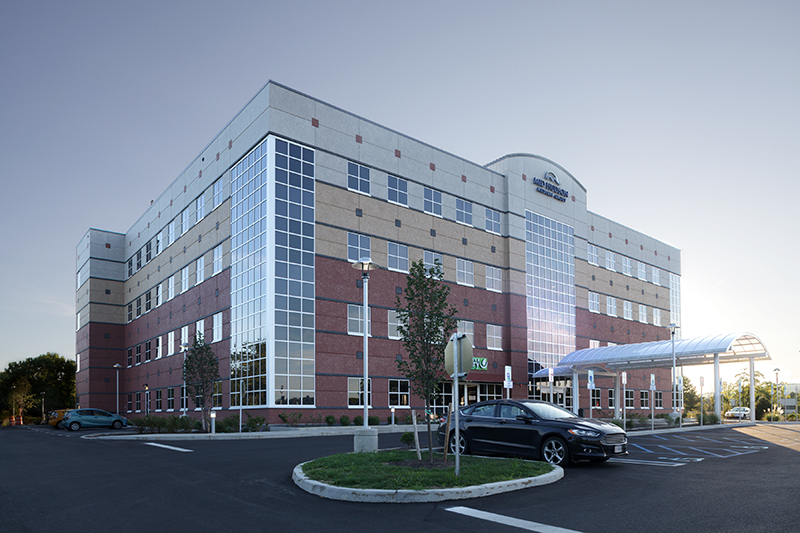 Optimus Architecture has designed and completed three major medical office buildings for Mid Hudson Medical Group (MHMG) with a 56,000 sf building in Poughkeepsie, NY, a 35,000 sf building in Rhinebeck, NY and now an 84,000 sf building in the Town of Ulster (Kingston), NY. This project, started in 2010, opened in September 2014 to considerable fanfare from the community. Optimus identified the site for MHMG, who was looking for a prominent, easily accessible and central location without the intense traffic of the nearby commercial suburban shopping malls. Optimus toured the area with MHMG’s CEO, pointing out locations and major transportation routes for the nearby hospitals, doctors’ offices, and patient residential areas. Optimus then presented this site as the perfect location for the largest medical group building in Ulster County. The site is bordered by a major limited access east west highway across the Kingston Rhinecliff Bridge, connecting Northern Dutchess County with Ulster County, and the north south local highway serving the regional commercial area. This location with it’s high profile position matched well with MHMG’s other prime locations with equal convenience for the medical group’s administration, doctors and staff who travel between their facilities. The site had both great strengths and some significant challenges. It was a former 10+/- acre precast concrete manufacturing and storage facility that had been out of business for nearly 20 years. The developer, Kirchhoff Companies, Inc., had significant environmental clean up to accomplish, a neighboring Conrail train tracks to deal with, and traffic light and highway improvements to make, all to create the environment necessary for this new high quality suburban medical and commercial park.